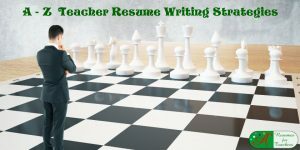 School teacher resume writing tips to help you land teaching job interviews and ultimately job offers. The resume you include in your job application represents you in your absence. Don’t underestimate the importance of writing a resume to target the new position you have your heart set on. 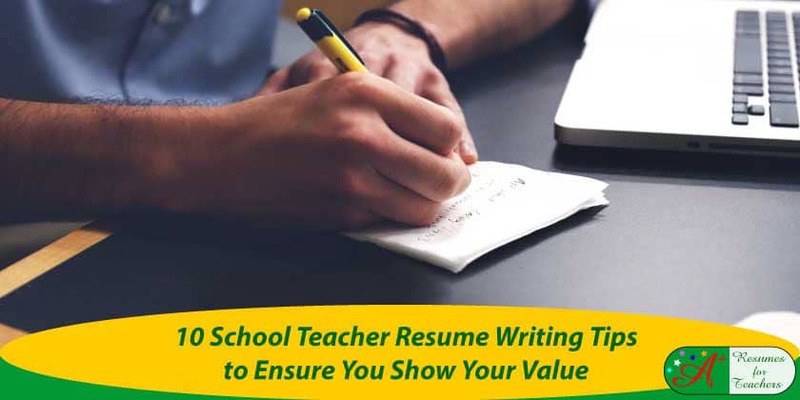 Ensure the resume you submit for the school teaching job you wish to secure communicates your top teaching skills along with success stories to prove you have those core competencies. 1. Make sure your resume for a school teacher makes YOU stand out. Even though it may seem like you are selling your resume and cover letter first, you are selling yourself first and foremost. Your resume must look and sound appealing; you need to make sure that you come across as a desirable candidate. While concentrating on developing an attractive design, ensure that you include all pertinent information, for instance, education, credentials, work experience, professional development, etc. 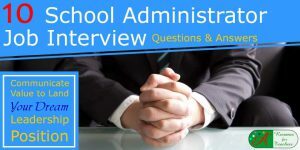 Assess the school district’s job advertisement, if available, and make sure that you have touched on all required qualifications in your cover letter. 2. Highlight the job position you are applying for or field of interest. Immediately following your contact information should be the job title you are targeting. Make it bigger than the rest of your text; treat it as you would a heading – bigger and bolder. 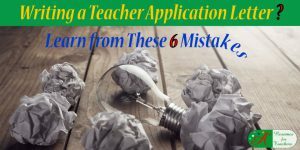 For example, you may write Teacher Assistant, Teacher Aide, Science Teacher, High School Teacher, Elementary Principal, Professional Educator, Adjunct Business Instructor. By doing so, you immediately draw focus to the position in question and leave the hiring manager with a clear idea of which position is of most interest. Tailor this to each job posting, if needed. 3. Implement an area of expertise or core competencies section. This area of knowledge section is crucial and if written correctly will set you apart from the competition. 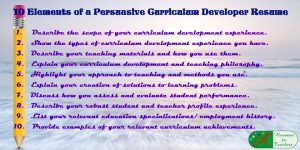 Focus on relevant and essential teaching skills needed to succeed in the job you are applying for and, of course, excelled at using. Concentrate mostly on hard or technical skills, i.e. competencies required for job performance. These skills could include classroom management, student motivation, parental communications, differentiated instruction, reading strategies, digital skills, etc. Examine soft skills such as problem-solving, organization, time management, relationship management, and self-reflection. List your qualities in a chart or bullet point format to make them stand out from the rest of your text. 4. Craft a well-written body that explores your work experience. Use headings for Professional Experience, Teaching History, Work Experience, Teaching Contributions, Relevant Experience, Business Experience, etc. This section is where you will list the places you worked, as well as the location, dates employed, and your job title. Make sure those items are bolded or one font size higher to make them stand out and reflect on their significance. After, you will lay out your job responsibilities in a concise and matter-of-fact manner. Usually, this would be organized in chronological order, from newest to oldest. The organization of your resume will depend on your background. If you are a career change or re-entering the education sector you may need to bring prior relevant experience up front and center. 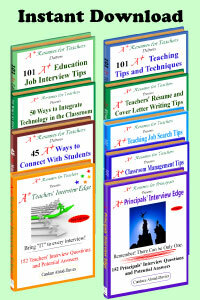 One of the top school teacher resume writing tips is to showcase your relevant achievements. Immediately following your job responsibilities think of a few key accomplishments that stand out in your mind that you can adequately articulate in your resume. An example would include an increase in student grade point average, reduction in absenteeism, securing a grant, increasing the grade level of a few at-risk students, etc., depending on the position you are targeting. Regardless of the achievement, make sure you explain how you accomplished it. List these in bullet point format to set them apart from the rest of your duties. Try to find at least a couple of achievements for each position. 6. List your greatest strengths that show your expertise relevant to the position. Analyze the job advertisement, if available, and see how the specified requirements correlate with the strengths you have demonstrated in a previous position. Perhaps you excel at collaborating to assess a situation and devise an appropriate reaction or solution. 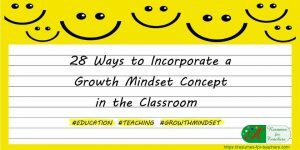 Maybe you are great at interacting with parents and working with them to meet students’ unique needs. On the other hand, you may be proficient in differentiated instruction to ensure you reach all learners to optimize learning outcomes. 7. Keep your writing compelling and concise. Succinct your writing for both of your job application documents. You do not want to drag on when explaining your job responsibilities. Keep everything brief and to the point. If your experience is in the same industry for the job in which you are applying, then the hiring manager should already know what each job entails. The same goes for the introductory paragraph of your resume. One paragraph or half a dozen or so bullet points should be enough to capture you as a professional. 8. Include anything relevant and discover your transferable skills. When writing your resume keep in mind anything you have done (paid work, volunteer experience, additional education) that pertains to your desired position. Transferable skills are a set of qualities you have developed in one job that directly correlate with or will help you perform the responsibilities of the targeted position. If you are a career changer, assessing your transferable skills is crucial! Evaluate your communication, interpersonal, time management, and leadership skills and anything else you think may give you an advantage. Since most school districts have many resumes to sift through, they can’t devote their time to reading every single one of them to the fullest extent. For this reason, it is paramount that you sell yourself right away, as in 10 – 12 seconds. When you feel like you are ready to submit your documents, take 15 seconds to scan them, and ask, “Would I hire myself?” If the answer is “no”, you need to make yourself stand out more. Let us create a resume and cover letter to skyrocket interviews. You may think to yourself, “Why should I invest to have someone else write my resume and cover letter?” But what if that professionally written resume lands you your dream job? Don’t take the chance of submitting a sub-par document, only to have it ignored, and leaving you with a lost opportunity. If you are 100% confident in your documents, then send them off immediately. 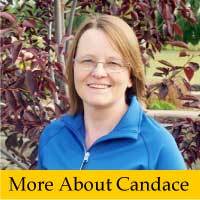 If you find that after reading these ten tips you are not entirely satisfied with your abilities or don’t have time to create the resume you need please contact Candace Alstad – Davies. 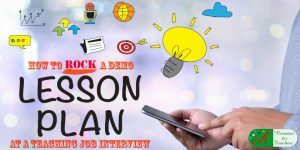 She is the Founder of A+ Resumes for Teachers – and has specialized in educators’ job search marketing documents and career coaching for 16+ years. Have you been procrastinating on writing your resume? Are you strapped for time and don’t want to miss deadlines? Are you happy with the job search documents you have? Do your resume and other written materials communicate the VALUE you can bring to a school district and its students? 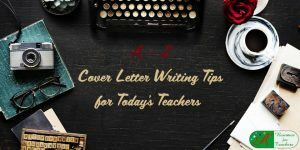 Are you a better educator than your resume and cover letter depict? Are you getting calls for interviews? I hope you found these school teacher resume writing tips valuable. If you can, please share this post with your friends, colleagues, and social media connections. Your resume, cover letter, LinkedIn profile are the only thing representing you in your absence. Make sure they do the JOB they are supposed to – that being – to get interviews! Do you have time to research what makes an impressive resume? If you answered no, then reach out to get resume writing help.